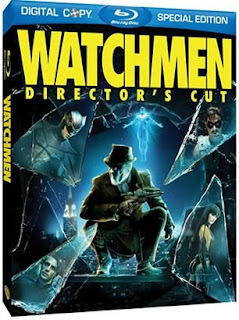 Watchmen: I never got around to catching the graphic-novel-turned-non-blockbuster during its briefer-than-expected theatrical run last spring, though I'm planning to check it out on disc; reviews have certainly been mixed (though DVD Talk's DVD Savant and Adam Tyner both give it fairly high marks), but Roger Ebert's four-star review from March remains my primary source of interest (though it should be noted, you can't always trust his four-star reviews). Midnight Express: I saw Alan Parker's harrowing film (based on Billy Hayes' true story of his stint in a Turkish prison) for the first time on Blu-ray and had a somewhat mixed response: it's brutal, effective filmmaking, yes, but also needlessly xenophobic and somewhat discombobulated. Worth a look, though. I Now Pronounce You Chuck and Larry: Also new on Blu this week--the only movie that seriously challenged Transformers as the worst film of 2007. 2 or 3 Things I Know About Her/ Made in U.S.A.: More mid-period Godard from Criterion this week, so this is as good a place as any to confess that I just can't seem to get worked about any Godard picture that isn't Breathless or Bande a part. I've seen plenty of them (Weekend and Contempt and 2 or 3 Things among them), and they just kind of leave me cold; I think Godard may have been right at the time, that his audience was fine with him basically abandoning narrative and making essay films and jumbles of ideas, but he loses me every time. That said, Criterion afficionado Jamie S. Rich's reviews of them are both pretty great. In Theaters: "(500) Days of Summer"
In Theaters: "In The Loop"
On DVD: "The Great Buck Howard"
On DVD: "Grey Gardens (2009)"
On DVD: "Bart Got a Room"
In Theaters: "The Hurt Locker"
On DVD: "Comic Legends Four-Disc Collection"